I often look for foods that will give me energy, help me curb cravings and provide me with lots of nutrition and vitamins. I never give too much thought about eating for my brain health, memory, focus and concentration. With age and being busy at work or with kids, we may not notice if we are becoming forgetful, losing our sharpness on the job or even feeling less creative. Let’s take a look at easy ways you can incorporate delicious foods into your diet for a healthy brain. During my research I came across a list of foods that are packed full of nutrients to benefit our brain health. I picked 5 foods to explore in more depth and the reasons why these foods will provide your brain with what it needs to keep you going day to day. GREEN LEAFY VEGETABLES - most of us already know the benefits of eating greens for inflammation and they contain lots of B-vitamins and folic acid. Eating greens like: kale, spinach, swiss chard, romaine lettuce can also help keep dementia at bay according to new research. In this study they looked at 950 adults for 5 years and those who ate greens 2x a day vs. eating no vegetables. The study revealed a slower mental deterioration even with factoring age, education and history of family dementia. Greens should be on your plate at every meal. 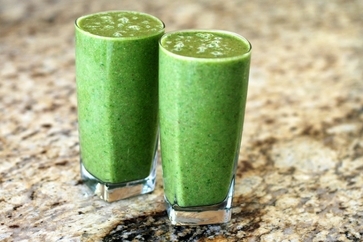 One way to get those greens flowing through your body is to add them to smoothies. Cook up baby spinach along with your eggs in the morning, salads at lunch and dinner. Just one cup of kale provides 684 percent of your recommended daily serving! I guess Popeye was right about his spinach. NUTS AND SEEDS -an excellent source of protein, providing us with antioxidant Vitamin E which is associated with less cognitive decline as we age. Here are some suggestions on how to add them to your diet. Walnuts- high levels of antioxidants that can improve mental alertness. Walnuts are also high in Vitamin E, and can also help ward off Alzheimer’s. Pumpkin seeds- these are higher in zinc than other seed. Zinc is responsible for enhancing our memory and thinking skills. High in magnesium, B vitamins and tryptoph the precursor to the good mood chemical serotonin. Flax seeds- also high in magnesium, B-vitamins, omega-3 fatty acids and fiber. These are all beneficial for mental clarity, weight loss, and focus. Flax seeds shouldn’t be eaten alone add them to smoothies, yogurt, salads and oatmeal. OILY OR FATTY FISH - contains omega-3 fatty acids which aid in memory, mental performance and behavior. People deficient in omega-3s can sometimes exhibit mood swings, poor memory, depression and fatigue. Examples of oily-fatty fish are: salmon, trout, mackerel, herring, and sardines. If you are not a fish lover, try supplementing with Fish Oil tablets, just check with your health care provider on quantity. BLUEBERRIES - Yummy, finally something a little sweet on our list for brain health foods. Blueberries are one of the highest anti-oxidant rich foods known to man including vitamin C, vitamin K and fiber. Brain protection from blueberries is from the high levels of gallic acid that protect us from stress and degeneration. Blueberries are easy to add to your diet, eat them by the handful, cereal, yogurt, smoothies, snack at night, desserts. DARK CHOCOLATE - Saving the best for last!! !Make sure you are getting chocolate with at least 70% cacoa, this will provide you with the brain benefits and not as highly processed or sugary and a small piece is all you need. Chocolate is full of flavonols which have high anti-oxidant and anti-inflammatory properties. Dark chocolate in small doses can uplift our mood and provide more focus for our brain. OTHER FOODS YOU CAN EXPLORE ADDING FOR A HEALTHY BRAIN. How are you adding in these foods for your brain health? What recipes would you like to share?